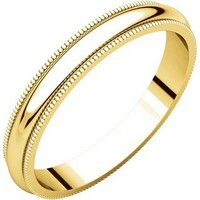 18K Gold Traditional Plain 4mm Comfort Fit Band - 18K gold, 4.0 mm wide, comfort fit, wedding band. The finish on the ring is polished. Other finishes may be selected or specified. 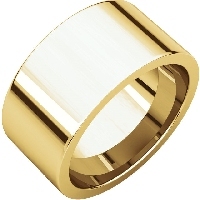 18K Gold 5mm Comfort Fit Plain Wedding Band - 18K gold, 5.0 mm wide, comfort fit, wedding band. The finish on the ring is polished. Other finishes may be selected or specified. 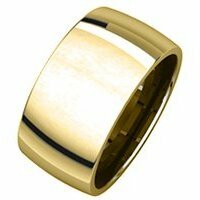 18K Gold Plain 3mm Comfort Fit Wedding Band - 18K gold, 3.0 mm wide, comfort fit, wedding band. The finish on the ring is polished. Other finishes may be selected or specified. 18K Gold 6 mm Comfort Fit Plain Wedding Band - 18K gold, 6.0 mm wide, comfort fit, wedding band. The finish on the ring is polished. Other finishes may be selected or specified. 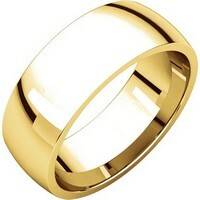 18K Gold Ladies and Mens 5mm Wedding Ring - 18 kt Gold Plain 5.0 mm Wide Half Round Wedding Band. This is a plain wedding band and is polished. Different finishes may be selected or specified. 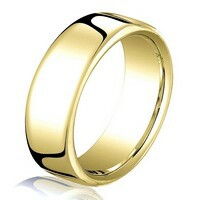 18K 4mm Men's Wedding Ring - 18 kt Gold Plain 4.0 mm Wide Half Round Wedding Band. The whole ring is a polished finish. Different finishes may be selected or specified. 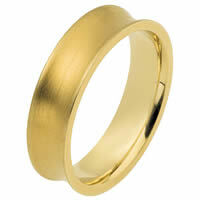 18K Gold 2mm Comfort Fit Plain Wedding Ring - 18K gold, 2.0 mm wide, comfort fit, wedding band. The finish on the ring is polished. Other finishes may be selected or specified. 18K Gold Double Milgrain 4mm Comfort Fit Wedding Band - 18K yellow gold 4.0 mm wide comfort fit double milgrain edge wedding band. The finish on the ring is polished. Other finishes may be selected or specified. 18K Gold 6mm Double Milgrain Comfort Fit Wedding Band - 18K gold 6.0 mm wide comfort fit double milgrain edge wedding band. The finish on the ring is polished. Other finishes may be selected or specified. 18K Gold 8mm Comfort Fit Wedding Band - 18K gold 8.0 mm wide, comfort fit wedding band. The finish on the ring is polished. Other finishes may be selected or specified. 18K Yellow Gold 6 mm Wide Wedding Ring - 18 kt Gold Plain 6.0 mm Wide Half Round Wedding Band. The whole ring is a polished finish. Different finishes may be selected or specified. 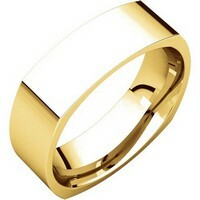 18K Comfort Fit Milgrain 5mm Wedding Band - 18K gold 5.0 mm wide, comfort fit, milgrain edge wedding band. The finish on the ring is polished. Other finishes may be selected or specified. 18K Gold 5mm Heavy Comfort Fit Wedding Band - 18K gold, 5.0 mm wide, heavy comfort fit, wedding band. The finish on the wedding ring is polished. Other finishes may be selected or specified. 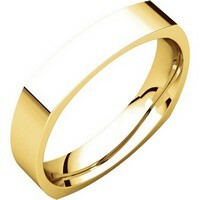 18K 10.0mm Wide Plain Wedding Band - 18K yellow gold comfort fit , 10.0mm wide plain wedding band. The ring has a polished finish. Different finishes may be selected or specified. 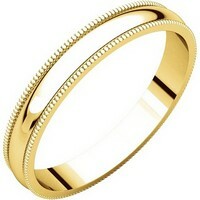 18Kt Yellow Gold 6.5mm Comfort Fit Band - 18 kt yellow gold, plain, comfort fit, 6.5 mm wide wedding band. The ring has a slight flat surface and comfort fit on the inside. It has a polished finish. Other finishes may be selected or specified. 18K Classic Comfort Fit, 6mm Wide Wedding Band - 18K gold 6.0 mm wide comfort fit milgrain edge wedding band. The finish on the ring is polished. Other finishes may be selected or specified. 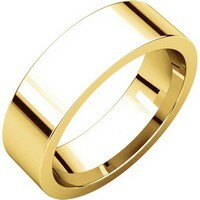 18K Flat comfort fit 3.0mm Wedding Band - 18 kt Gold Plain 3.0 mm Wide Flat Comfort Fit Wedding Band. The ring is a polished finish. Different finishes may be selected or specified. 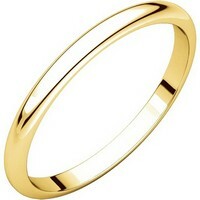 18K Gold 2 mm Women Plain Wedding Ring - 18 kt Gold Plain 2.0 mm Wide Half Round Wedding Band. The whole ring is a polished finish. Different finishes may be selected or specified. 18K Yellow Gold 4mm Milgrain Edge Comfort Fit Band - 18K gold 4.0 mm wide, comfort fit, milgrain edge wedding band. The finish on the ring is polished. Other finishes may be selected or specified. 18K Gold 3mm Milgrain Edge Comfort Fit Wedding Band - 18K gold 3.0 mm wide, comfort fit, milgrain edge wedding band. The finish on the ring is polished. Other finishes may be selected or specified. 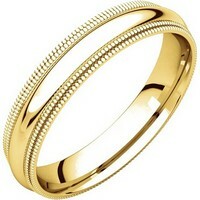 18K Yellow Gold 5mm Wedding Band - 18 kt, yellow gold, high dome, 5.0 mm wide, plain wedding band. The finish on the ring is polished. Other finishes may be selected or specified. 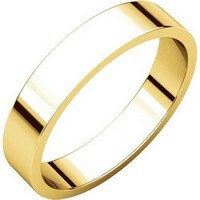 18K Gold 2.5mm Milgrain Comfort Fit Plain Wedding Band - 18K gold 2.5 mm wide, comfort fit, milgrain edge wedding band. The finish on the ring is polished. Other finishes may be selected or specified. 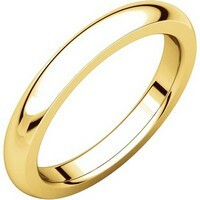 18K Gold Plain 4 mm Wedding Ring - 18 kt Gold Plain 4.0 mm Wide Flat Comfort Fit Wedding Band. The whole ring is polished. Different finishes may be selected or specified. 18K Gold 7 mm Wide His or Hers Wedding Ring - 18 kt Gold Plain 7.0 mm Wide Half Round Wedding Band. The whole ring is a polished finish. Different finishes may be selected or specified. 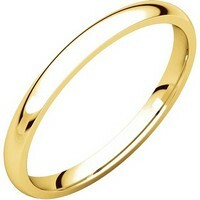 18K Gold 6mm Heavy Comfort Fit Plain Wedding Band - 18K yellow gold, plain heavy comfort fit, 6.0 mm wide wedding band. The finish on the wedding ring is polished. Other finishes may be selected or specified. 18K Gold 4mm Wide Comfort Fit Wedding Band - 18 kt yellow gold, comfort fit, 4.0 mm wide and 2.55 mm thick, heavy Wedding Band. The ring is completely polished. Different finishes may be selected or specified. 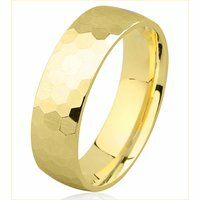 Gold Square Comfort Fit Men's Wide Wedding Ring - 18kt Yellow gold square, comfort fit, 4.0mm wide wedding band. The ring has a square shape and has a brushed finish. Different finishes may be selected. 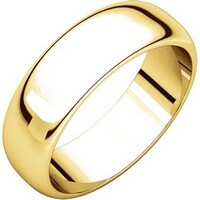 18K Gold 3mm Wide Wedding Ring - 18 kt Gold Plain 3.0 mm Wide Half Round Wedding Band. The ring is completely polished. Different finishes may be selected or specified. 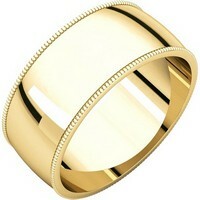 18K Gold Flat Comfort-Fit Band. 10.0MM Wide - 18 kt gold plain 10.0 mm wide flat comfort-fit wedding band. The ring is completely polished. Different finishes may be selected or specified. 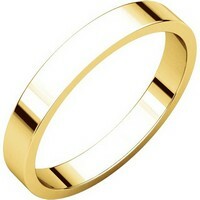 18K Flat Comfort fit 6mm Wedding Band - 18 kt Gold Plain 6.0 mm Wide Flat Comfort Fit Wedding Band. The ring is completely polished. Different finishes may be selected or specified. 18K 6mm Comfort Fit Men's Wedding Band Brushed. 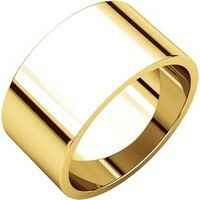 - 18K gold band, 6.0 mm wide , center brushed. The center of the ring is a satin brush finish and the edges are polished. Different finishes may be selected or specified. 18K Gold 2mm Heavy Comfort Fit Plain Wedding Band - 18K yellow gold, heavy comfort fit, 2.0 mm wide wedding band. The finish on the ring is polished. Other finishes may be selected or specified. 18K Yellow Gold 8mm Comfort Fit Wedding Band - 18K yellow gold, plain heavy comfort fit, 8.0 mm wide wedding band. The finish on the wedding ring is polished. Other finishes may be selected or specified. 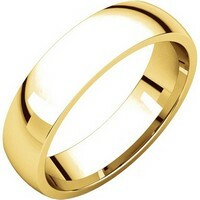 18K Comfort Fit Milgrain 8mm Wedding Band - 18K gold, 8.0 mm wide, comfort fit, milgrain edge wedding band. The finish on the ring is polished. Other finishes may be selected or specified. 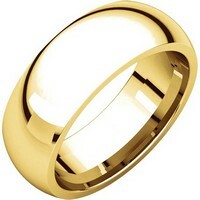 18K Gold 9mm Domed Wedding Ring - 18 kt gold plain 9.0 mm wide half round, high dome wedding band. The ring is completely polished. Different finishes may be selected or specified. 18K Gold 3mm Heavy Comfort Fit Plain Wedding Band - 18K gold, 3.0 mm wide, heavy comfort fit, wedding band. The finish on the ring is polished. Other finishes may be selected or specified. 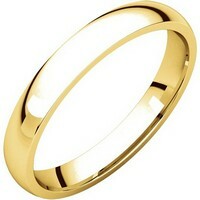 Gold Comfort fit 5mm Plain Wedding Band - 18 kt Gold Plain 5.0 mm Wide Flat Comfort Fit Wedding Band. The ring is completely polished. Different finishes may be selected or specified. 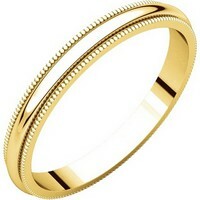 Gold Plain comfort fit 4.5 mm Wedding Band - 18 kt yellow gold 4.5 mm wide and 2.55 mm thick heavy comfort fit Wedding Band. The ring is a polished finish. Different finishes may be selected or specified. 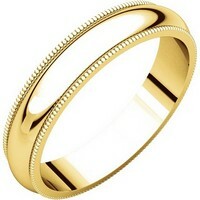 18K Yellow Gold 10mm Wide Wedding Band - 18 kt yellow gold, 10.0 mm wide, flat, plain wedding band. The finish on the ring is polished. Other finishes may be selected or specified. 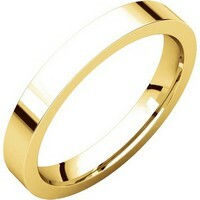 18K Comfort fit 8 mm Plain Wedding Band - 18 kt Gold Plain 8.0 mm Wide Flat Comfort Fit Wedding Band. The ring is completely polished. Different finishes may be selected or specified. 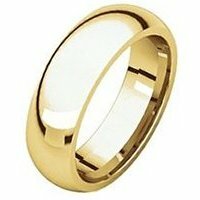 18K Domed 6mm Wedding Band - 18K yellow gold, 6.0 mm wide, comfort fit wedding band. The ring is curved inward with a matte finish. Different finishes may be selected or specified. 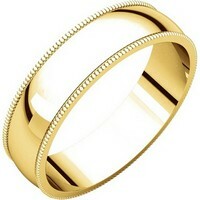 18K Wedding Band 5mm Brushed Center - 18K yellow gold, 5.0 mm wide, center brush-finish, plain wedding band. The center of the ring is a satin brush finish and the edges are polished. Different finishes may be selected or specified. 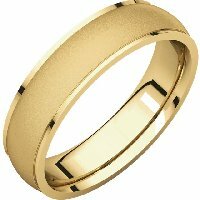 18K Gold 7mm heavy Comfort Fit Plain Wedding Band - 18K gold, heavy comfort fit, 7.0 mm wide, plain wedding band. The finish on the ring is polished. Other finishes may be selected or specified. 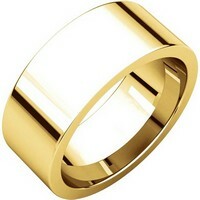 18K Yellow Gold Milgrain 3MM Wide Plain Wedding Band - 18K gold 3.0 mm wide, milgrain edge wedding band. The finish on the ring is polished. Other finishes may be selected or specified. 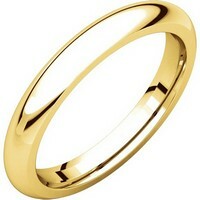 18K Yellow Gold 7mm Comfort Fit Plain Wedding Ring - 18K gold, comfort fit, 7.0 mm wide, plain wedding band. The finish on the ring is polished. Other finishes may be selected or specified. 18K Yellow Gold 6mm Wide High Dome Plain Wedding Band - 18 kt, yellow gold, high dome, 6.0 mm wide, plain wedding band. The finish on the ring is polished. Other finishes may be selected or specified. 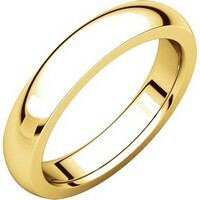 18K Yellow Gold 4mm Wide Milgrain Plain Wedding Band - 18 kt gold 4.0 mm wide, milgrain edge wedding band. The finish on the ring is polished. Other finishes may be selected or specified. 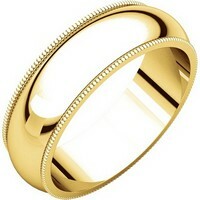 18K Plain Wedding Band Yellow Gold Milgrain Edge - 18kt yellow gold, 5.0 mm wide, milgrain edge wedding band. The finish on the ring is polished. Other finishes may be selected or specified. 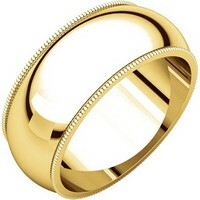 18K Yellow Gold Milgrain Edge Plain Wedding Band - 18kt gold, 8.0 mm wide, milgrain edge wedding band. The finish on the ring is polished. Other finishes may be selected or specified. 18K Gold 6mm Milgrain Comfort Fit Wedding Band - 18 kt yellow gold, 6.0 mm wide heavy comfort fit, milgrain edge wedding band. The finish on the ring is polished. Other finishes may be selected or specified. 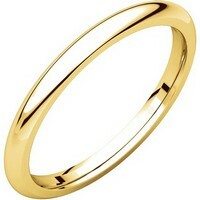 18K Yellow Gold Flat Women's Plain Wedding Ring - 18kt gold, plain, 3.0mm wide, flat wedding band. The wedding band is a polished finish. Different finishes may be selected or specified. 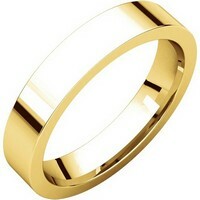 18K Plain 4mm Wide Flat Wedding Band - 18 kt gold, plain, 4.0mm wide, flat wedding band. The wedding band is a polished finish. Different finishes may be selected or specified. 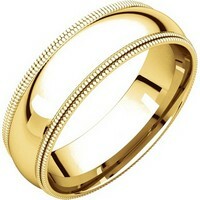 18K Plain Wedding Band High Dome - 18 kt, yellow gold, high dome, 3.0 mm wide, plain wedding band. The finish on the ring is polished. Other finishes may be selected or specified. 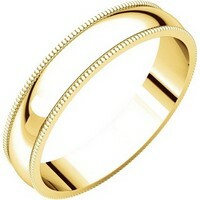 Yellow Gold Plain 7 mm Wide Comfort Fit Wedding Band - 18K yellow gold, 7.0 mm wide , comfort fit wedding band. The finish is polished. Different finishes may be selected. 18K Yellow Gold High Dome Plain Wedding Ring - 18 kt, yellow gold 2.0mm wide, high dome, plain wedding band. The finish on the ring is polished. Other finishes may be selected or specified. 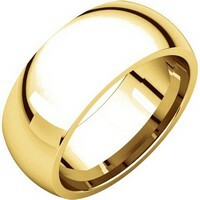 18K Gold 10 mm High Dome Plain Band - 18kt yellow gold, high dome, 10.0 mm wide, plain wedding band. The finish on the ring is polished. Other finishes may be selected or specified. 18K Gold 5mm Milgrain Comfort Fit Wedding Band - 18kt Yellow gold, 5.0 mm wide heavy comfort fit, milgrain edge wedding band. The finish on the ring is polished. Other finishes may be selected or specified. 18K Gold 8mm Milgrain Comfort Fit Wedding Band - 18 kt yellow gold, 8.0 mm wide heavy comfort fit, milgrain edge wedding band. The finish on the ring is polished. Other finishes may be selected or specified. 18K Yellow Gold 6.0 mm Square Wedding Band - 18 Kt Yellow gold wedding band, 6.0 mm wide, comfort fit wedding band. The band is squared and has rounded edges for a comfort fit. The finish on the ring is brushed. Other finishes may be selected or requested.